The food offerings are rather mediocre. I've never cared for their schnitzel, the mashed potatoes aren't great either and the brats pass as acceptable. 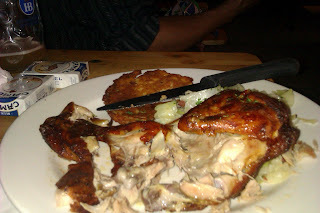 I have to say though, I loved the roast chicken they served me at happy hour (pictured above with cigarettes.) It was well seasoned, succulent and comparable to the chicken I had while I was in Germany. Something about the German style of roast chicken is a little bit different. I think it is just a slightly less salty and more flavorful version of American chicken with some type of alternate seasoning blend. If you happen to know, please leave a comment. Finally, some tips: Hofbrau doesn't offer a happy hour. They have tons of promotional bands and competitions, usually on weekends. If you go on a weekend, prepare to wait in line. The outdoor seating is some of the best in the city, don't jump the fence though - you will be asked to leave.